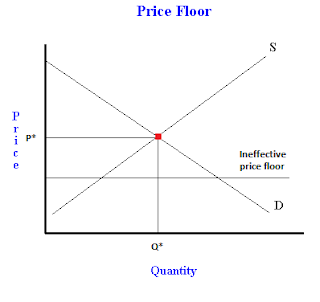 Home equilibrium price ceilings floor supply and demand What is a price floor? Examples of binding and non-binding price floors. What is a price floor? Examples of binding and non-binding price floors. Price floors are common government tools used in regulating. A price floor is the other common government policy to manipulate supply and demand opposite from a price ceiling. A price floor means that the price of a good or service cannot go lower than the regulated floor. A minimum wage law is the most common and easily recognizable example of a price floor. However, other price floors exist in any sector that the government is trying to protect such as agricultural goods or other sensitive industries. To intuitively understand a price floor, imagine dropping a rock in your house. The rock cannot go lower than the floor because it will hit the floor and stop. The same concept holds with prices and a price floor. The price cannot go lower than the price floor. Where this gets tricky is that a BINDING price floor occurs ABOVE the equilibrium price. It may be confusing to have a floor above something, but if you think it through it does make logical sense sense. If a rock wants to fall from an altitude of 50 meters to an altitude of 20 meters, than the floor must be above 20 meters in order to be effective. If the floor is at 10 meters, the rock (price) can fall to 20 meters with no problem. Economics classes want students to be able to recognize the difference between binding and non binding price floors. The trick is to remember that prices are free to operate ABOVE a price floor (just like standing on a floor) so any market price above the price floor will not be affected in any way. Consider the example of a minimum wage law in California. Imagine the minimum wage is $8.00 per hour. If a company wants to pay someone $10.00 per hour, than there is no problem because this price is above the floor. However, if a company wants to pay an employee $6.00 per hour, than the there is a problem because this amount is below the price floor. The latter example would be a binding price floor, while the former would not be binding. 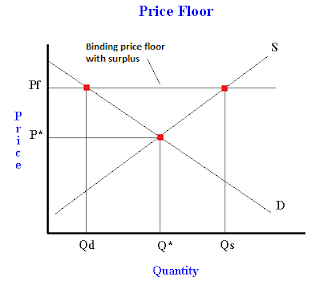 Note that the price floor is below the equilibrium price so that anything price ABOVE the floor is feasible. Another way to think about this is to start at a price of 100, and go down until you the price floor price or the equilibrium price. If you hit the price floor first, it is binding. However, if you hit the equilibrium price first, the price floor is not binding is not. Since our original price floor of $4.00 was ineffective, what happens if we increase the price floor to $10.00? This will raise the price floor line on the graph above the equilibrium price level. You can now see that the equilibrium price is BELOW the price floor, so it is not possible for the equilibrium price to be attained. This means that suppliers (labor) are willing to supply a higher quantity than originally supplied (because of the higher price) and consumers (firms) are going to demand a lower quantity than originally demanded. This results in a surplus (unemployment) because quantity supplied is higher than quantity demanded. As long as the price floor is present, there will be a surplus in the market, and some of the suppliers that are willing and supply their labor will not be able to find a job (a firm willing and able to hire them at the price floor price). Price floors are a common government policy to manipulate the market. They are generally used to increase prices (such as wages) but are only effective (binding) when placed above the market price. When a binding price floor is used, it will create a deadweight loss (if the market was efficient before the price floor introduction). Omg, you're SO right! Look at Burger King, Wendy's, Wal-Mart, etc- they ALL went out of business because of minimum wage! Oh, wait, no they didn't. Hmmm, this must mean only one thing: the value of their labor pool is STILL higher than they are paying. I'm sure you know what you're talking about on some level, but your analogies need a LOT of improvement. Your post shows that you don't have even an elementary understanding of economics or state/welfare capitalism. Why don't you google the effects that raising the minimum wage has on inflation? For your basic understanding they raised the minimum wage at Burger King and now they can't afford to charge four dollars for a burger so they now charge five. Simply yay the Burger King employee gets more money but now anyone who made more than minimum wage's money doesn't stretch as far. Oh and since minimum wage went up for the Burger King employee it went up for the Walmart employee too. That means the Burger King employee can't afford anything extra at Walmart. A lot of good that raise did everyone. 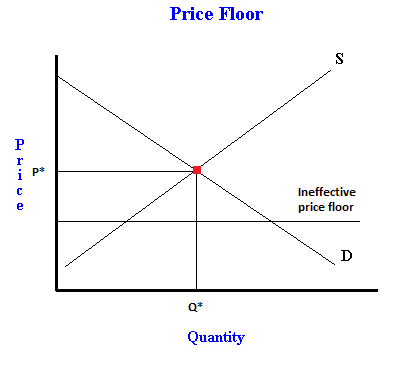 A price floor is a government- or group-imposed price control or limit on how low a price can be charged for a product. A price floor must be higher than the equilibrium price in order to be effective.